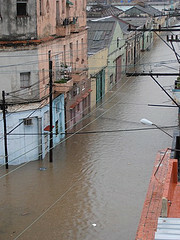 On Saturday, August 11, a strong rain caused floods in the capital’s Central Havana neighborhood. 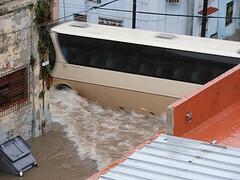 It rained non-stop for three hours and as a results of the garbage in the streets and the blocking of the sewers, the neighborhood of La Victoria remained under water for several hours. 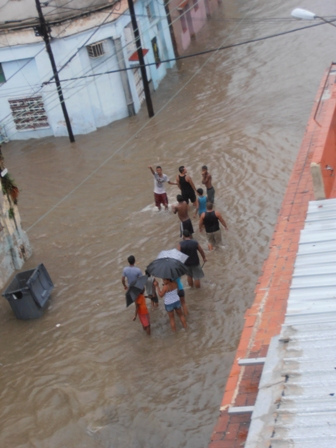 The residents ran around getting their furniture and appliances to safe places to protect them from the water. Those who didn’t have time to safely store their belongings had no alternative but to watch their things destroyed. 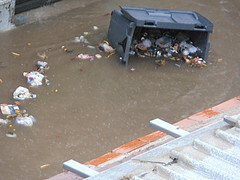 The contents of the dumpsters on the corners which are always overflowing were swimming in the water and the trash was floating in the streets. After taking several pictures and when the water started to go down I went out to talk to several people and the discontent was widespread. 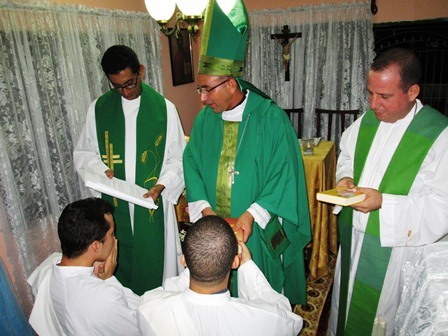 This Saturday my husband, Ricard Medina, and I prepared to journey to Camagüey with the objective to then proceed to Santiago de Cuba where we wanted to participate in the Mass that His Holiness Pope Benedict XVI would offer in the Plaza of Antonio Maceo. 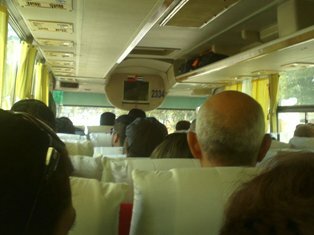 We left on 2 pm bus that arrived after 11:00 pm in Camagüey. We went to the house of Irel Gomez Moreira, delegate of the Cuban Independent Democratic Party, who lives in Palomino Street at No 621, as we had a work plan to found a delegation of young members of our organization in that area. When we arrived we found a little suspicious that a Lada made car was coming very quietly in front of us in those very desolate streets, it was apparently a couple. The next day, or Sunday, we got up very early to start all the agreements and were leaving the house at 6:20 am when a man dressed in civilian clothes and in quite a rush intercepts us on the road to ask for our identification. On the corner the same Lada car was waiting, with the same woman and man; we demanded they show us their IDs, they wanted us to get into the Lada but we refused because if they were going to arrest us let them take us in a patrol car along with Irel. They took is to the State Security (G-2) Operations Center. It was so early we noticed that the guards were just getting up. They took us into a room in the structure that I imagined was used for people arriving in the cells. An official called me and in a small room began to inspect me and let me alone with the toilet and clothes. A lieutenant came in to search my body. They took me inside where the cells were, and in an office a woman no more than 25 ordered me to take off all my clothes, which I refused, she told me that if my bra has underwires she had to remove them because I couldn’t go in the cell with the wires because if I killed myself it was her responsibility and she would have to face the military prosecutors. I took off my bra under my blouse and she tried to break them and I told it to give it back, it belongs to me but I wasn’t going to break it. The young woman did as I said and didn’t insist, and then she called “control” as they call the jailer, and he took me to cell 3 where there was a woman on the edge of madness because she’d been there more than 12 days for an economic crime and had high blood pressure. Then she saw me and we started we to talk and I asked her why she was there and she desperately started to tell me everything. Within minutes they took me out of the cell, a guard called me by the number 96 to which I didn’t answer, and he told me, upset, that I was deaf, he was calling me, and I told him I had a name and that I didn’t answer to numbers for anyone and not to bother me calling me again. He took me out and a major named Fernando, according to him, showed me Ricardo’s cell phone that has various Twitter text messages from some friends informing us hat there was repression around the Pope’s visit and he said they were inciting us to go to the mass and shout “freedom,” and I started to laugh and said, look, search the Internet, these Tweets are from our friends, stop being so scared, because even the word “freedom” upsets them, this is a right that is born in all human beings and in you too and they took it from you, too, and the guy slapped the table and said look, read this order of detention and sign it. When I read it, it said that we were arrested for disturbing the peace, of course I refused to sign it and he, greatly annoyed, ordered them to take me back to the cell. An hour or so went by — in a walled cell it’s impossible to calculate the time and I couldn’t see a single ray of light — a guard came by, the same one that checked me in, to bring me a mattress, I said you brought me here without a mattress, without food, without water, I’ll let you watch me and I went to bed with my back to the door as if I didn’t care at all about a wooden bed in the corner. After a while they brought a doctor who asked if I suffered from anything, I just answered that yes, I was allergic to her Revolution and to olive-green. She just looked at me, took the blood pressure who was there and left with her very quickly. In a few minutes they came back and took me to an office where I waited for the Chief of the Jail who told me I had to answer a series of questions that Major Fernando would pose and then everything would be resolved and they would take me and my husband to Havana. They left because there were more guards in the office where they took me and one asked me what we were doing in Camaguey and what did the Cuban Independent and Democratic party do, from where we knew Irel. I told him I was in Camaguey because as a Cuban I could go wherever I wanted in Cuba, that I knew Irel just like a knew a ton of people in Camaguey and that the party I belonged to wanted to have free elections and that there i a multi-party system that respects Human Rights and doesn’t put women in dungeons for the way they think and express themselves. The man, upset now, asked when I was last detained, I said last Sunday, and he said this makes you feel really strong, right? And asked how much schooling I had, I told him Technical School, I graduated in Clinical Biology but I couldn’t continue my schooling because — according to the regime — I wasn’t “reliable.” He opened to door and told the guard to take me back to the cell. 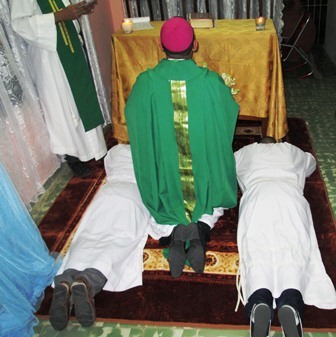 Then he immediately turned to me to sign a report about what, according to him, we said, a report I refused to sign and so I put I REFUSE, and they quickly got me out of there because according to them there was no time, they returned my possessions, searched us minutely, and took Ricardo and me in big Lada that said G-2, leaving us at the National Astro bus station. 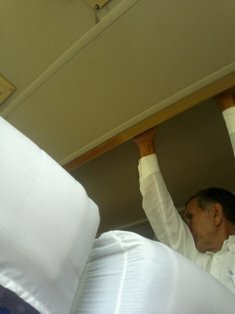 I asked them for money for the tickets, they delayed the bus for 45 minutes, all the people on the lookout and the official escorted us the entire trip, carefully watching our every step. Arriving in Havana at a stop near our house, in Manglar, we got off unexpectedly leaving the man who was guarding us unable to react. Thanks be to God we are home and thanks to all my friends for your concern and your Tweets. Directors of the Cuban Independent and Democratic Party in Havana, on the afternoon of Thursday 22 December, personally expressed their condolences to Mr. Frantisek Fleisman on the occasion of the passing of the former Czech president Vaclav Havel, in the embassy of the country located in Kohly # 259 Nuevo Vedado, Havana. 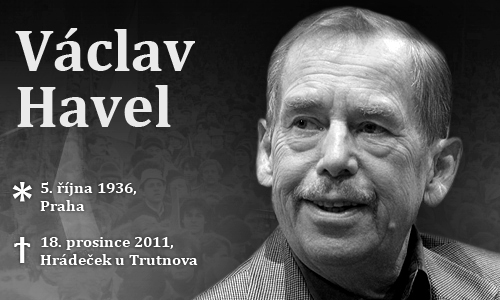 Mr. Fleisman, who serves as Political Adviser to the Czech diplomatic mission accredited in Havana, personally received the message of condolence and several copies of the weekly publication of the CID “The New Republic,” after which the representatives signed the condolence book open at the embassy to facilitate the people of Cuba sending messages of condolence to the family and the Czech people for the death of former Czech president Vaclav Havel, information totally ignored by the Cuban media. Present at the mournful meeting were Abdel Rodriguez Arteaga, National Vice President of CID; Lisbán Hernandez Sanchez and Elizabeth Linda Kawooya Toca, Delegate and Vice Delegate in Central Havana, Aimé Cabrales Aguilar, Attention to Political Prisoners in Havana and Santiago Ricardo Santiago Medina Salabarria, the National Executive Committee of the CID, who highlighted and appreciated the closeness and concern of Václav Havel for the political prisoners, the opposition movement and the democratic destiny of the Cuban people. Fleisman was interested in the work of the party. 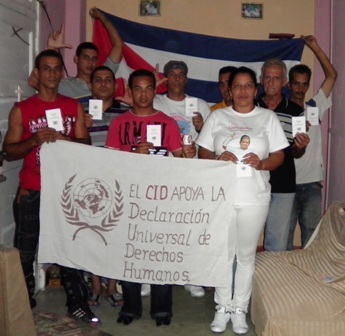 The Cuba Independent and Democratic Party (CID) in the municipality on October 10, paid tribute to Laura Pollan, at 6:00 pm on December 10 at the home of Aimé Cabrales Aguilar, located in the Fonts Street # 143 (interior) between 11 Beales in the Lawton neighborhood, under police surveillance. The homage included a recitation of the thirty points of the Universal Declaration of Human Rights by the audience, they rose in prayers for the eternal rest of the late founder of the Ladies in White movement Laura Pollan, they dedicated a bouquet of flowers and lit a candle to her memory, condemned the crackdown unleashed nationally, on this date, against the internal opposition movement and acts of repudiation against the headquarters of the Ladies in White. At the commemorative event Maikel Jose Suarez Rivero was received as a member of the municipal delegation; he said he would fight in the struggle to demand the rights of all Cubans. “I am grateful that I have been accepted into the ranks of the Independent and Democratic Cuba Party on a significant day, especially when it is dedicated to honor the woman famous for Cuba and the world, Laura Pollan,” he concluded. The United States Interests Section paid tribute to the leader and founder of the Ladies in White, Laura Pollan, with a reception at the residence of Mr. John Caulfield Chief of Section, between the hours of 9:00 – 11:00 a.m. the morning of Dec. 7. Official state security photographed participants coming and going from the event. Laura Maria Labrada Pollan daughter of Laura and Secretary of the National Executive Committee of the Cuban Independent and Democratic Party (CID) confirmed that the gala tribute was part of the Celebration of the Human Rights Week and was dedicated to Agnes Laura Pollan Toledo, founding leader Ladies in White Movement that now bears her name, after her physical death on October 14, without being aware of the real causes of death. 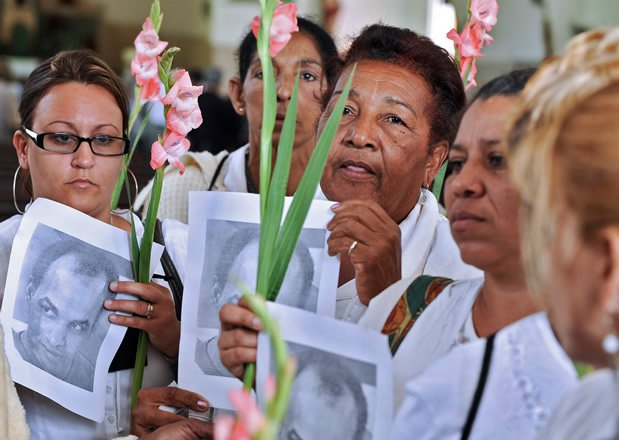 The program consisted of several papers, beginning with her widower, the former prisoner of conscience Hector Maceda, titled “Laura, Her Presence and Her Legacy”; “Laura, La Mariana of her time” by Berta Soler; “A woman who helped to reclaim the streets for Cuba’s peaceful opposition,” by Guillermo Fariñas Hernández”; “Laura, in her words,” by her daughter Laura Maria Labrada; “Laura the future ahead,” by Yoani Sanchez, who interspersed her speech with a multimedia presentation illustrating the 63 year life of Laura Pollan; and concluding with the words of the Assistant secretary of State Roberta Jacobson. Her daughter thanked those who in one form or another worked on or participated in the event. 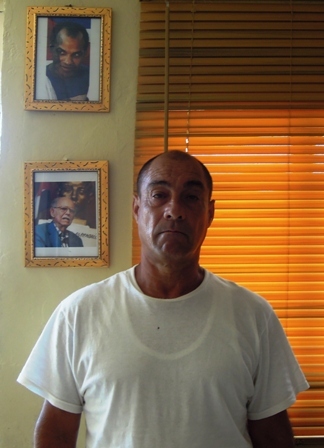 Elpidio Rodriguez Casas, delegate of the Cuban Independent and Democratic Party in the municipality of San Miguel del Padrón, refused to appear in response to a subpoena issued by the Lieutenant Nelson of state security to 3:00 pm on August 3, the municipal unit of the National Revolutionary Police. Homes Rodriguez declared his disagreement with the summons to appear arguing that he does not have to be interviewed by any officer of State Security. The security of the state visited the Committee for the Defense of the Revolution (CDR) associated with the residence of Elpidio Rodriguez Casas, located at Dolores #18514 between Calzada de San Miguel and San Mariano, Rocafort neighborhood, to ask them to evict him from his home after the departure of his son to the United States of America. 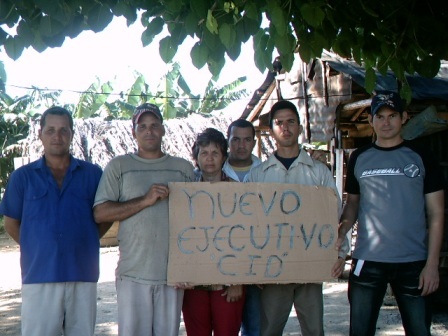 Activists of the Cuban Independent and Democractic Party (CID) in the municipality of San Juan y Martinez met at the home of Rasbel Espinosa Caraballo, located in the Jesus Menendez Cooperative, Monterey, San Juan y Martinez municipality, on the afternoon of Sunday, December 4 to select the new executive of the organization in the village. The provincial delegate congratulated the new government and encouraged them to work together, strengthening the organization and growth in the area. In the name of the Secretary of the National Executive Committee of the CID a moment of silence was announced for Laura Maria Labrada Pollan, followed by prayers for Laura Pollan founder of the Ladies in White and ending with the reading of the Declaration of Caracas. The Laura Pollan Ladies in White movement held its Literary Tea and celebrated December 10 as International Day of Human Rights under two acts of repudiation organized by government authorities on December 9 and 10, in front of its headquarters on Neptune between Hospital and Aramburu streets, Centro Habana municipality. 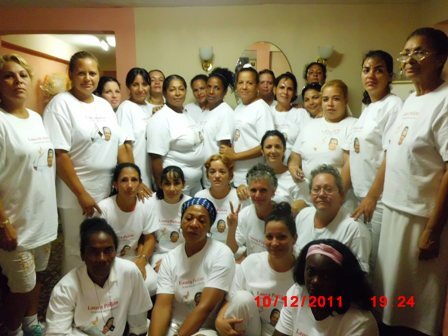 More than two dozen activists with representations from different parts of the island were able to evade the political police and shelter for two days at the headquarters of the Laura Pollan Ladies in White Movement, to celebrate the Literary Tea for the International Day of Human Rights suffering acts of repudiation organized by state security who days earlier called in the UJC militants and the PCC to repudiate the group of women. 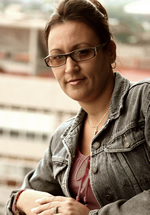 Laura Maria Labrada Pollan, Secretary of the National Executive Committee of the CID, confirmed that on the ninth day she had paid tribute to her mother Laura Inés Pollán Toledo, founder and chief spokesperson who died last October 14, with the display of clothing worn by Laura in their Sunday marches, which defined her life in battle clothes, the projection of the song dedicated to his mother by the exiled Cuban author Amaury Gutierrez, and a twenty minute protest banging of pots and pans. “On the 10th we suffered another act of repudiation, in which they shouted that we were prostitutes of the empire, worms, traitors, mercenaries, among other obscenities, etc., and prevented us from taking to the streets,” she said. “There is one report of many women who were arrested and others who were ordered on home arrest and remained for two days in police custody,” she concluded.